July 28th, 2015 | Posted by Velda in ACUPRES.,MERIDIANS, REFLEX. I am sure most of us have experienced that nagging tightness and discomfort at the top of either or both sides of our back. 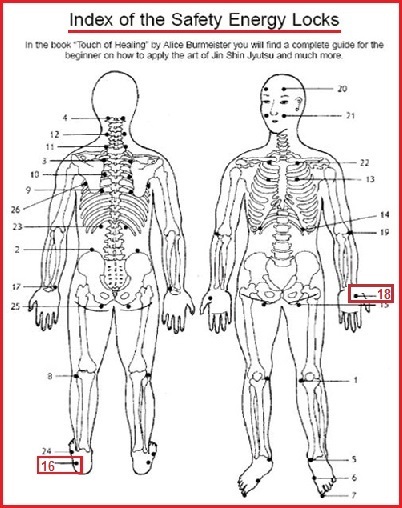 These spots are near the spine and beginning of shoulder blade caused by energy blocks. 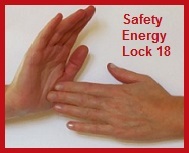 Jin Shin Jyutsu®, (The Touch of Healing, by Alice Burmeister with Tom Monte) refers to these points as SEL #11, which stands for Safety Energy Locks. 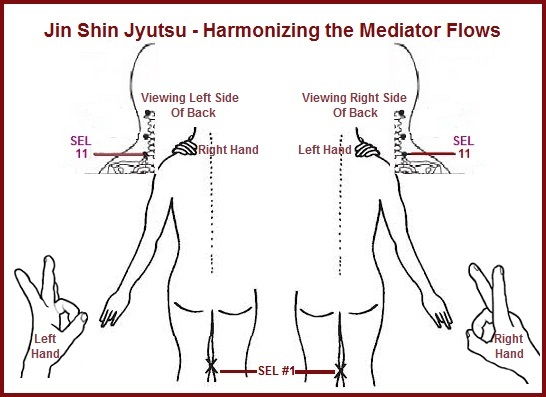 You can practice this simple exercise using Jin Shin Jyutsu® to reduce fatigue, tension, and stress. It is called Harmonizing The Mediator Flows. This practice helps bring harmony and balance to your body. Many find it calming and use it to fall asleep, while others use it to invigorate themselves upon awakening. For optimum results, you can use this daily, whenever needed for a couple of minutes on each side. If you spend a great deal of time at the computer, it is a No-brainer….try it! 1. Place left thumb over left ring fingernail. Make a circle with the pad of thumb over ring fingernail. (This helps to clear the chest). 3. Bring the knees together so that the inner sides touch (SEL#1). 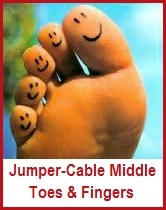 The feet may be together or apart, whichever is comfortable. (This revitalizes the descending energy). 1. Place right thumb over right ring fingernail. 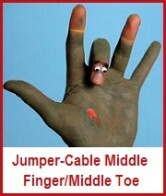 Make a circle with the pad of thumb over ring fingernail. (This helps to clear the chest). This is the last of the series of the Jin Shin Jyutsu® 8 finger poses described by Alice Burmeister with Tom Monte in their book The Touch of Healing. 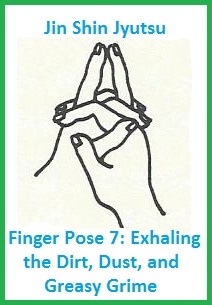 Today we will cover both Finger Pose 7 & 8 which stated in the book helps bring harmony to the total being. Finger Pose 7 aids in releasing general daily tension and stress from the head, lungs, digestive functions, abdomen, and legs. it also strengthens the ability to exhale and unloads any accumulated dirt, dust, and greasy grime. 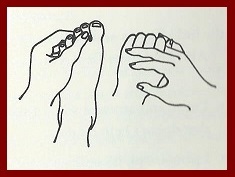 Technique: Touch the palm sides of the left and right middle fingers in the folded hands position (as shown in illustration). This last Finger Pose 8 helps to release the tension in the back and promotes an overall feeling of well-being. It also strengthens our ability to inhale and receive the purified breath of life. 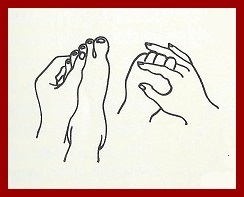 Technique: Bring the left and right middle fingernails together (see illustration). Hold these positions for several minutes and whenever you feel a need for improving exhaling or inhaling for body, mind, and spirit harmony. 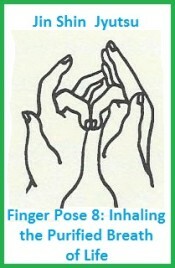 Finger Pose 6 strengthens the respiratory function and helps balance all ear-related problems. This pose can help us breathe more easily while walking, jogging, running or exercising. 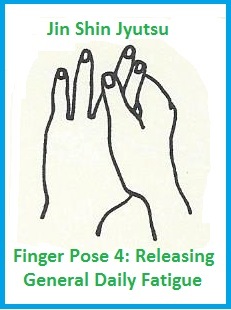 Jin Shin Jyutsu® Finger Pose 6 as mentioned in the book The Touch of Healing by Alice Burmeister with Tom Monte also can be used when flying or driving in high altitudes. 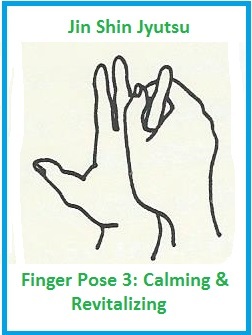 Use Mudra Finger Pose 6 with any of the following physical or emotional conditions: 1. My skin condition is terrible. 2. I feel rejected and unloved and get teary easily. 3. I’m all thumbs. I’m clumsy. 4. I’ve lost all of my common sense. 5. My ears are bothering me. Technique: Touch the right ring fingernail with the palm side of the thumb and hold for several minutes. Reverse for left ring finger and thumb. 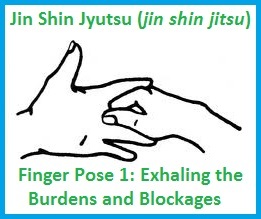 Jin Shin Jyutsu® Finger Pose 4 aids in releasing the fatigue, tension, and stress that can build up during one’s day It assists in the release of worries, fears, and anger. This mudra pose can be used to ease the following mental or physical difficulties: 1. I get so tired. 2. I feel insecure about everything – my health, my wealth, my happiness. 3. I’m beginning to feel old and look old. 4. I get irritated and angry over nothing. 5. I worry about everything. Technique: Hold the back of the left thumb, index, and middle fingers with the right thumb. Place the rest of the right fingers on the palm side of the left thumb, index, and middle fingers. Hold this position lightly for several minutes or longer and then complete this technique for the right thumb and fingers. (This information is taken from The Touch of Healing by Alice Burmeister with Tom Monte. We will continue tomorrow with Finger Pose 5). Zin Shin Jyutsu® Pose 3 is for calming the body, releasing nervous tension and stress, and revitalizing all organ functions as described in The Touch of Healing by Alice Burmeister with Tom Monte. This pose can also be used whenever you feel any of the following states of mind or physical symptoms: 1. I get so nervous. 2. I worry about my heart. 3. I can’t walk too long without getting out of breath. 4. I’m always ‘trying-to’. 5. I get so depressed. I have no fun. Technique: Hold the palm side of the left little and ring fingers with the right thumb. Place the other right fingers on the back of the left little and ring fingers (as shown). Hold this pose lightly and as long as you desire. Remember to reverse technique for the right fingers. First I want to thank a colleague for practicing with me the 8 finger mudra poses from the book The Touch of Healing by Alice Burmeister with Tom Monte to experience the healing vibration before covering them in BWB. We were both very amazed at the vibrational energy felt and how it moved to appropriate and different areas on both of us. Start: by holding the palm side of left middle finger lightly with right thumb placing the rest of the right fingers on the back side of left middle finger. This pose aids in releasing generalized tension and stress head to toe. It helps with exhaling harmful stagnation and blockages of energy. One can spend as little as a few minutes practicing finger pose 1 mudra on left middle finger then repeat pose 1 mudra on right middle finger. 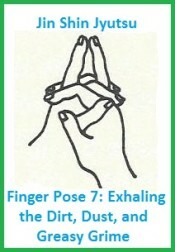 The authors recommend this mudra can also be used with any of the following concerns: 1. I can’t see well. 2. I have a hard time exhaling. 3. I get frustrated. 4. I’m tired all the time. & 5. I have trouble making up my mind – I’m a procrastinator.